As you know, Martineau Gardens is a haven for wildlife. And as custodians of this precious oasis, we’re delighted to announce that a Nature Trail Guide is now available. Aiming to explain how we manage this part of the Gardens for wildlife, the Guide also illustrates what habitats can be seen and what species to look out for. The Trail leads you along a numbered track through the wooded, wildlife area (designated a Site of Local Importance for Nature Conservation or SLINC) before emerging by the wildflower meadows and the Bird Hide. The guide has been written by Brian Perry and Isobel Swinscoe, and paid for by Be Birmingham. A donation of £1 per copy will help us raise funds to keep the Gardens open. 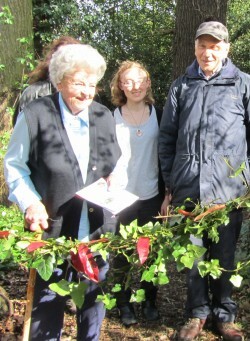 The Trail was launched today (31 March 2011), by patron for the Gardens, Mollie Martineau. Mollie equipped with secateurs sniped through an evergreen, ‘living’ ribbon made from foliage of the Gardens.